Happy Friday, everyone!! I am SO glad the weekend is finally here! We had a fun week with Halloween and all the festivities, but it was also a kind of crazy, stressful week. Almost six months ago I was invited to speak at the university I attended so that happened yesterday and I’ve been a nervous wreck all week preparing for that. But it went well and it’s over (huge sigh of relief!!!!). So to say I’m ready for a lazy weekend with my babies is an understatement! I wore this look earlier this week to a few meetings and I got a lot of questions about it, so I thought I’d share the details with all of you! I don’t wear stripes too often but when I saw this sweater at Nordstrom I had to get it. It’s a fun way to add pops of color to your wardrobe and it’s actually super comfy; definitely a sweater I’ll be wearing a lot this season! I hope you all have a great weekend! Thanks for dropping by! Loving your outfit! Great fall look and that bag is beautiful. 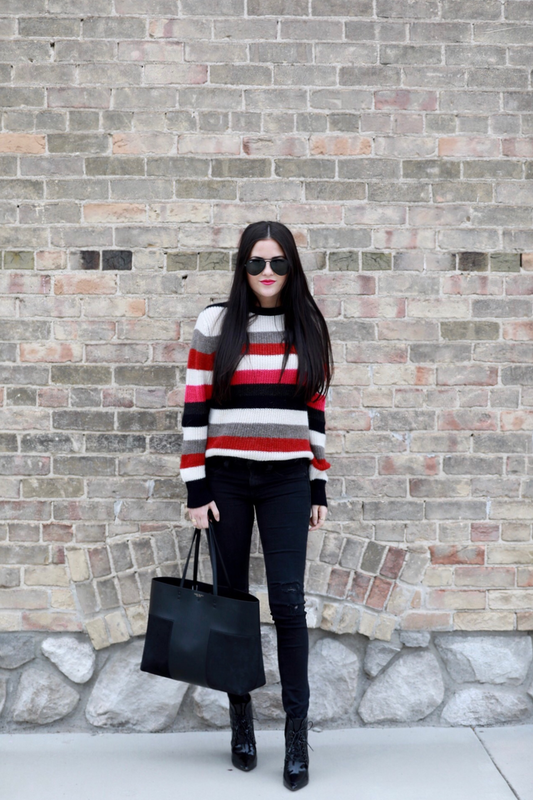 Love the striped sweater! So cute! Those booties are so fun! What a great fall sweater! Congratulations on speaking at your alma matter- how exciting! I love that sweater, Rach! It’s so unique in the color combinations and looks so comfy! I’m also swooning over those ankle boots, too! How awesome that you were asked to speak at your old university, I can imagine it was both stressful and exciting, but you did it! Thanks for sharing and enjoy your relaxful weekend! The sweater is so amazing! Love the colors. 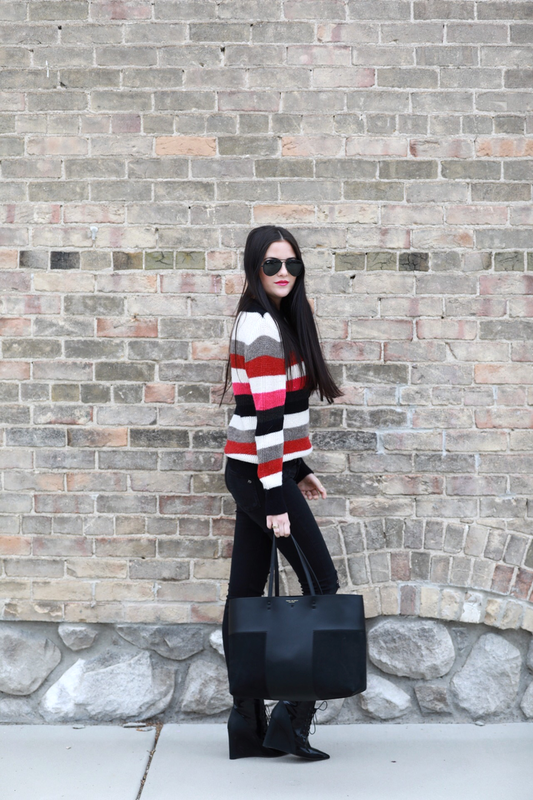 Love the red and pink in this sweater! So cute!! I love that sweater so much ! It is not only chic and different but super comfortable as well, so you could literally wear it everyday (not that you should lol but just saying). I have a very similar one that I wear to death, so great for fall ! super cute as always! I love a nice striped sweater!! This look is SO cute!! I love those patent leather booties!! Thank you Lauren! Yes they are amazing! wow love your cool tote bag! 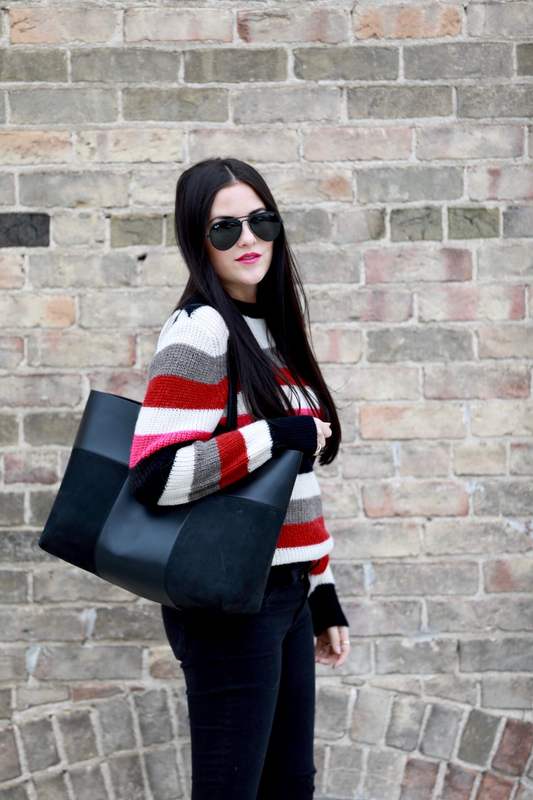 Love the sweater paired with that lipstick, while everything else is black – the perfect pop of colors! Definitely a crazy busy week!! Very much looking forward to the weekend! Love the outfit and beautiful pics!! Beautiful! May I ask what size are you wearing in the sweater and how tall are you. It says it runs small…also is it soft on the skin? I am kind of sensitive to some cloth materials. Thanks! I’ll going to New York, Manhattan in December.Do you know about Nordström’s has a shop there? I live in Sweden and my big dream to go to the United States is about to be fulfilled. I’m sure there’s a Nordstrom there! I hope you have a fun and safe trip! Omggg I looove these shoes!!! <3 They look amazing. Do you mind letting me know what size you’re wearing in this sweater. Thanks!